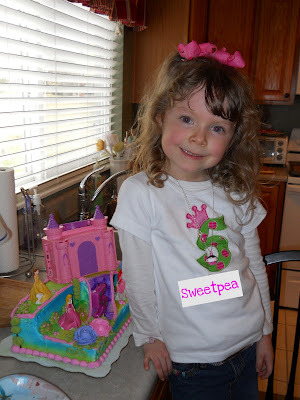 As you probably know, Sunday was Sweetpea's birthday! She wanted to go to dinner at "the pizza place" with Mimi and Gaga. After pizza, (and beating Gaga at air hockey) we went home for cupcakes and presents! On Sunday, we celebrated with our family and friends. Sweets would have invited every person that she had ever met before if I had let her! And she tried - but I had to reign her in. She had a great time at her party! It was a Cinderella party (to the dismay of the boys attending) complete with "pin the crown on Cinderella"! D even behaved itself rather well! Game Over. THAT was what she wanted. Of course, the Walmart closest to us did not have the kit. So, after calling around to EVERY store in the area, I FINALLY found it (at a store that required my parents to put their lives in a bit of danger in order to pick it up!). And she was one happy little girl! The best part was her wish. After everyone sang to her and she blew out her candles, we told her to make a wish. She leaned in to me and whispered, "Know what I wished for?" "I wished that we could be in Florida and that I could meet Cinderella and see her castle." "That is a wonderful thing to wish for!" I said. She wished for something that every five year old girl SHOULD wish for. She did NOT wish for a cure. Let ME wish for the cure. Let it be the wish I make every birthday, every time I toss a coin in a fountain, and every time I see a shooting star. And on her birthday, her wish showed that she is just that! I LOVE it!!! I'm all teary-eyed and smiling all at the same time! What a wonderful wish!!! Thats awesome!!! I love that she was just being a lil girl and not a lil girl with D! Happy bday Sweetpea!! Best wish ever! That's our girl! Aw, this is great! Every little girl deserves a party like this. :) Also, that cake is AWESOME! Good for her! I too hope she gets her wish and is able to meet Cinderella someday soon. She deserves it! Happy B-Day Sweetpea!! Great wish for a great gal! Love the pictures! Precious! Looks like a really fun 5th birthday party. I'm so glad that she enjoyed her day, just as a princess should! I love that she didn't wish for the CURE too Hallie. "Normalcy" is a beautiful thing and "gift" that you are giving her by doing such a wonderful job parenting and pancreating. Looks like a wonderful 5th birthday party. I would have loved to been part of the pin the crown on the princess bit! Totally crying my overly hormonal very pregnant eyes out. This wish thing has been getting to me lately. Burst out crying in car this week when that song Airplanes came on the radio. As soon as it said I could really use a wish right now I lost it. So glad that's not the first thing your baby thought of when it was time for her wish!!! THAT is an awesome wish! She looks sooooo happy. And so grown up. Happy birthday!